Asegúrate de que el dispositivo móvil esté encendido, desbloqueado (si el dispositivo tiene habilitado el bloqueo) y luego conéctalo a una computadora compatible usando el cable USB provisto. Use this for Motorola devices manufactured prior to 8/20/2013 and Prepaid devices. 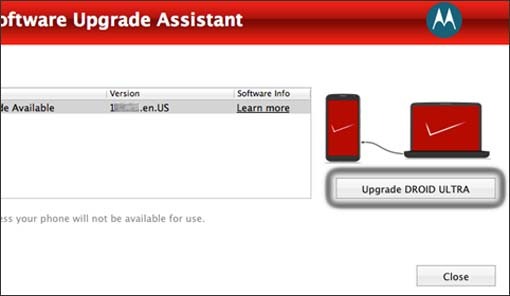 For newer Motorola devices, refer to Software Update - Software Upgrade / Repair Assistant. Para obtener ayuda para activar/desactivar la verificación automática de actualizaciones, consulta Habilitar/deshabilitar actualizaciones automáticas. From the SUA, click Upgrade (located on the right). When the software upgrade process has completed, click Close (located in the lower right). If the update fails to install, please refer to the Software Repair Assistant para más información. Se usan los siguientes pasos cuando la verificación de actualizaciones automáticas está desactivada. When the device is connected via USB, right-click the Software Upgrade Assistant tray icon (located in the lower right of the desktop) then click Check for device update. 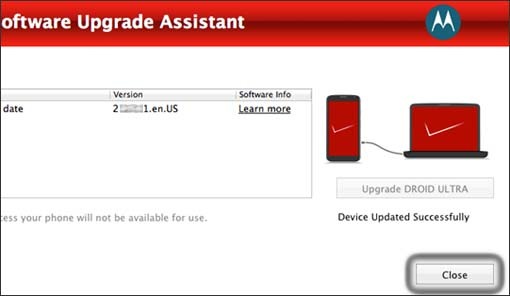 When the device isn't connected via USB, navigate Start > All Programs > Verizon Software Upgrade Assistant then connect the device to begin the update check. If an update is available, click the Motorola device name. Click Upgrade (located on the right). If an update is available, a pop-up is presented on the menu bar. Click Update to launch the SUA. When the device is connected via USB, click the Motorola icon (located in the menu bar) then click Check for device update. 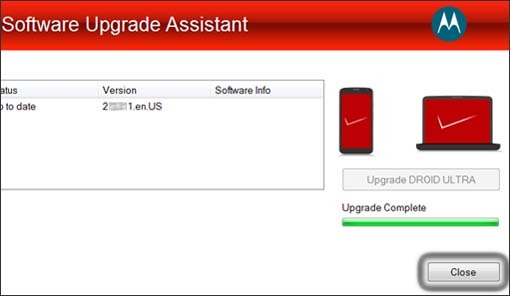 When the device isn't connected via USB, navigate Application Folder > Verizon Software Upgrade Assistant then connect the device to begin the update check.